Adding a touch of elegance using a decorative vertical groove, CUBEwall™ is a unique slatwall design having both vertical and horizontal grooves. This classic series creates interest to any environment. 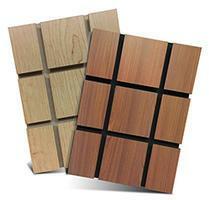 CUBEwall™ has half grooves on all four outside edges, providing a continuous look for multiple panel installations. The standard panel groove is 6” on center but can also be customized. CUBEwall™ grooves can remain unfinished or be painted. CUBEwall can be manufactured using Anchor™ Core or medium density fiberboard (MDF). Anchor™ Core is 50% stronger than slatwall made with MDF core.